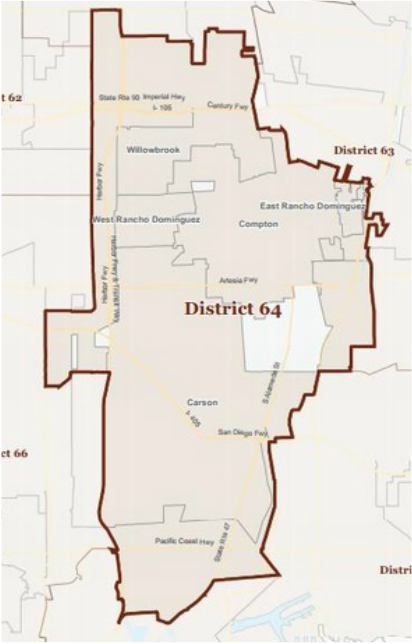 Democrat Mike Gipson currently represents Assembly District 64 and will not be termed out until 2026. Gipson is expected to win re-election in 2016. Mike A. Gipson first elected to the California State Assembly in November 2014, represents the 64th Assembly District that includes the communities of Carson, Compton, Gardena, Harbor Gateway, Lynwood, North Long Beach, Rancho Dominguez, South Los Angeles, Torrance, Watts/Willowbrook and Wilmington. Serving on the Carson City Council from 2005 to 2014, Assemblymember Gipson was selected by his peers to serve as the Mayor Pro Tem. Gipson also previously served as Chief of Staff to Chairman Jerome E. Horton, the first African-American elected to the California State Board of Equalization, and whose district currently serves 8.5 million residents. As a former area organizer for the 48,000-strong United Teachers Los Angeles (UTLA), Gipson is passionate about ensuring that those who educate our children be treated with dignity and respect. Prior to working for UTLA, he was the Legislative and Political Director for Service Employees International Union (SEIU) Local 399, the Political Director Statewide for Justice for Janitors 1877 SEIU and a Business Representative for SEIU Local 99. Gipson worked as a Staff Aide to Congressman Mervyn M. Dymally, State Senator Bill Greene and Los Angeles Councilman Robert Farrell, and as Field Representative for then L.A. Councilman Mark Ridley-Thomas. He was also an appointee of Supervisor Yvonne Burke to the County of Los Angeles Community Action Board, where he was the youngest ever to chair the powerful funding agency that distributes $10 million annually in Community Service Block Grant funds. As a Carson resident, he served on the Public Safety and the Human Relations Commissions and as a board member of Carson’s Workforce Investment Network. Additionally, Gipson formerly served as Vice President of the Advisory Board for the State Public Utilities Commission. He served as the Chairman of the Board of Director for Positive Imagery Foundation, Inc., a Los Angeles-based agency that deals with HIV/AIDS and other STDs in the African-American and Latino communities. He is also a former chair of the California Contract Cities’ Legislative Committee and a past chair of its Resolutions Committee. Assemblymember Gipson is also at the helm of two productive endeavors targeting at-risk youth: the S.O.S. (Saving our Sons) and the R.O.S.E. (Reaching Out to our Sisters Everywhere). Gipson earned his Bachelor of Science in Business/Management from the University of Phoenix and his Associate of Arts degree from the Los Angeles Southwest College. He also attended One, One, One School of Theology. He received his Police Officers Training at the South Bay Police Training Academy where he graduated into a career as a police officer for the Maywood Police Department.